Stefan now has an Android Binding ready so you can use GNU Smalltalk to easily run ST applications on your Android device. Versioner is a new GUI for Metacello. Code is here. With Smalltalk you can script your Dr. Geo Drawings as this video shows. Sven also released NeoCSV - a reader and writer for the CSV format in Pharo. Documentation is here. Sven made his NeoJSON available which you can use to read and write JSON. Webcasts from the ACM Turing event. One is a presentation from Alan Kay named "Extracting energy from the Turing Tarpet". Alan uses the Frank system (remember Frankenstein monster) which is based on Squeak Smalltalk. As ever a very interesting presentation. Hope to find the time to watch also the others. If you want to find it on the page click into the playlist in the video and scroll down to Alans talk. Softwarenaut is an interactive visualization tool for understanding software systems. It was originally written in VisualWorks. Looks like it is also ported to Pharo. I already reported that Pharo/Squeak Smalltalk is able to run on Android using CogDroid project. Hilaire used this to implement his DrGeo for Android which is available in the Google Market. 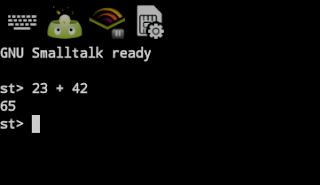 Now Stefan crosscompiled GNU Smalltalk to Android. A binding to Android APIs is still missing - but it basically runs. The source is on GitHub if you want to help. Want to know more internal details about Fuel - the new Smalltalk object serializer written in Pharo? Then read this PDF. Nice video on TDD (Test Driven Development) using BabyMock with Smalltalk. The new draft chapter from Lukas on PetitParser for the upcoming "Pharo by Example" book is available online. The Smalltalk PetitParser is now also available for Java and Dart. Take care with the water on your desk. Otherwise this can happen to your Smalltalk browser. Code is here. Smalltalk offers nice technologies for web development ranging from Seaside, Iliad up to Aida and other frameworks. Between 18th and 22nd there will be an online workshop on how to create a website using Smalltalk with the Aida framework. Janko Mivsek (creator of the framework) will answer questions. Here is a video on running the old ST-80 on the iPhone. Nice video on Magritte 3. Voyage is another approach in the Smalltalk/Pharo world to persist object models. It was written by Esteban Lorenzano, I think mainly with the goal to persist data from Pier (the CMS system) images. You will find his slides from the Pharo 2012 conference here. Francois Stephany is a beta tester and is already blogging how to use Voyage in conjunction with MongoDB. The code can be found in the Voyage project at smalltalkhub. The slides and pictures from the pharo conference are available.